Looking for long-lasting, durable fencing? Today’s composites offer the look of wood without all the maintenance. Not all composite fencing contains recycled or reclaimed materials, so be sure to inquire if you’re looking at brands other than those listed below. Close the Loop (made in Pennsylvania) offers post and rail fencing made from 100% recycled HPDE plastic (mostly milk jugs) that require no painting or staining. It comes in colors of black, gray and cedar. Fiberon® fencing is made from locally-sourced, discarded wood flour (8%) generated from other wood processes and 84% recycled high-density polyethylene (HDPE) from plastic milk jugs, shampoo and laundry detergent bottles. Three colors are available: weathered pine, pacific redwood, coastal cedar. The company is mindful of the environment and recover 98.5% of all material waste from their manufacturing processes. Fiberon fencing comes with a 20 year warranty. Nature’s Composites’ TerraFence is made in the USA from wheat straw and recycled HDPE. They offer a 20-year warranty on a variety of styles in shadow box, privacy, basket weaves, ranch 2-rails, as well as ornamental styles. Their composite fencing does not splinter or crack, and needs no painting or staining. 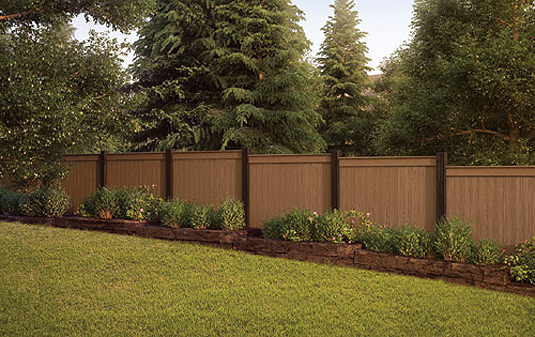 TimberTech FenceScape composite fencing is made from reclaimed wood flour and available in a rich, warm mountain Cedar color. There’s no painting, staining or sealing, and FenceScape won’t split, rot, warp, crack, splinter or suffer termite damage. TimberTech offers a 25-year warranty. Lifetime Lumber has decided to exit the composite building product sector. Compositology broke this a week or so ago. Be careful which brand you choose. Don’t assume it is environmentally friendly. Also, you probably get what you pay for, but remember, this stuff is made to last with zero maintenance. Consider that when pricing them out. Especially if you live in the more extreme climates (heavy rain, hot sun, severe freezing, etc.). You may also want to have a professional install, as you are investing a pretty penny up front so you probably don’t want it to look shoddy. You can usually tell when a DIY’er put in a fence vs. a pro. But, you may need to balance that with the high price point of the material.